Sort, wash, dry, fold, iron, repeat. 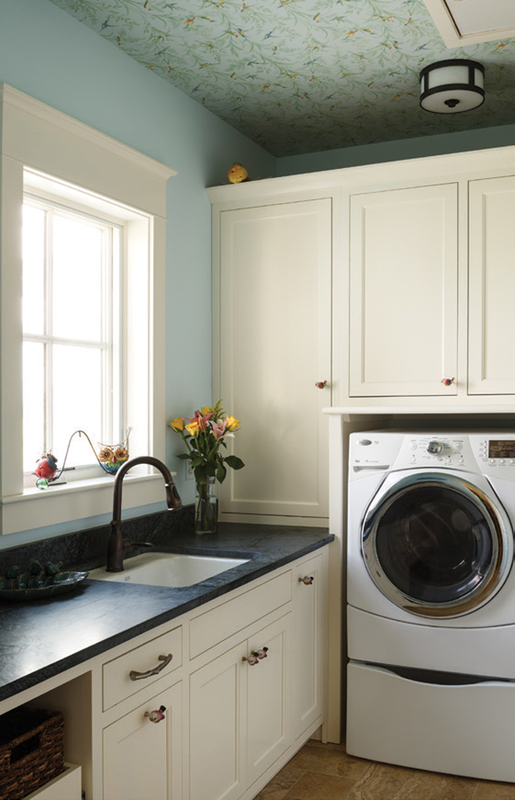 Life in the laundry room rarely (okay, never) feels like a thrill ride, and it’s not usually on the top of the list when it comes to home-style updates. But considering that clean clothes are one of the necessities of life, why not ask for more—from both a functionality and a design perspective—from the space you spend so much time in to get those clothes clean? From a budget-friendly freshen-up to a total overhaul, whether you’ve got a closet or a ballroom-sized laundry space to work with, showing your laundry room a little affection can help the whole process of getting clothes clean go more smoothly—and, dare we say, make you enjoy caring for your clothes a whole lot more. Here, we’ve got some ideas to get you on the path to an updated, organized and efficient laundry area. 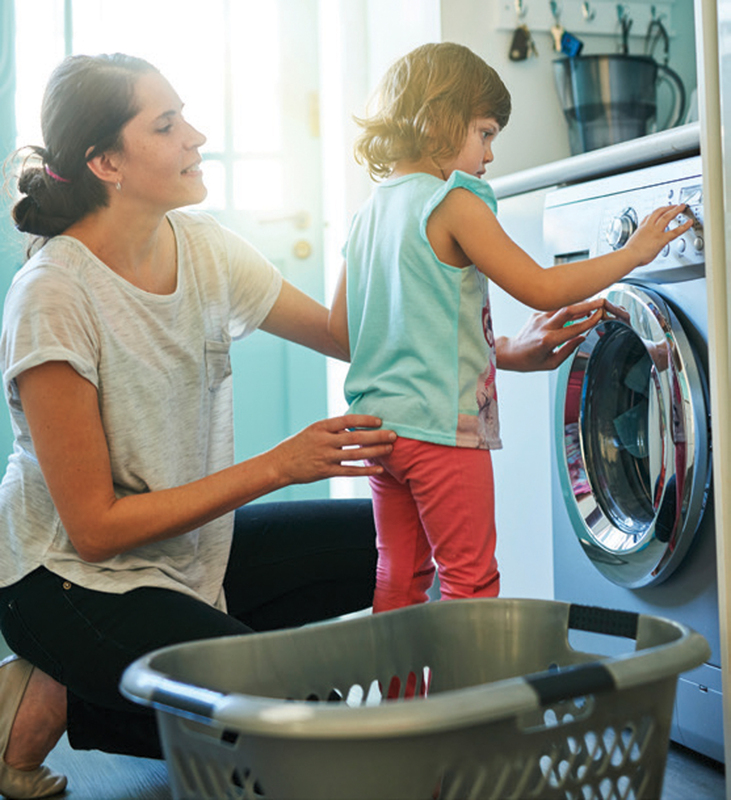 First things first: take stock of your laundry area’s form, function, available space and condition of the key appliances that help you get the job done. If you’re remodeling or building a new home, look to locate your laundry area closest to the area of your home where the most dirty laundry collects, or near bedrooms where clean laundry is put away. Another potential location would be between the garage/house entry and kitchen—a strategy that could turn your laundry area into a multitasker, doubling as a mudroom or entry drop zone. Last but not least: consider the location of your washer and dryer within your laundry space in terms of noise and vibration that may travel to other floors or rooms. If you’re working with an established area, look for places to make space-use improvements, such as moving walls if your budget allows, purchasing a stackable washer and dryer, or creating or installing additional storage. Next up, evaluate your main work horses. Washer/dryer need an upgrade? Washer/dryer technology has changed considerably in recent years, so do your homework on what kinds of features you want and can afford. 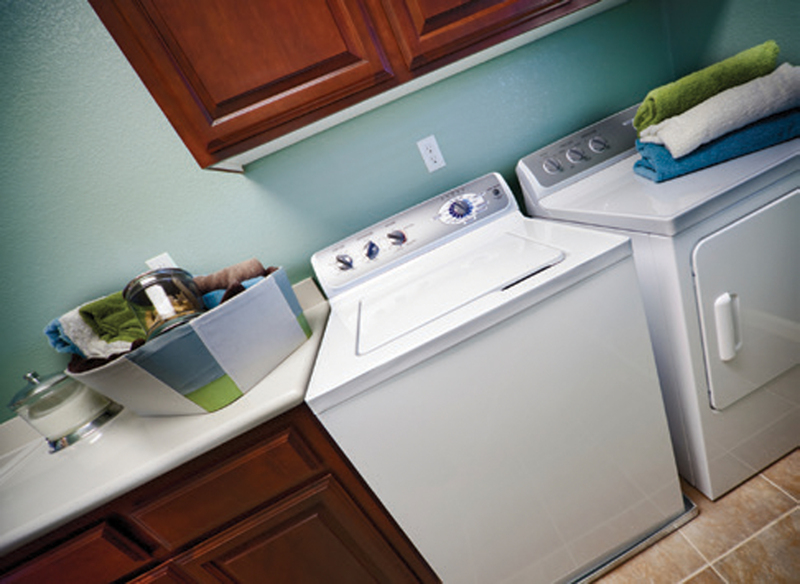 You’ll also have to decide on top-loading versus front-loading washers, and stacked versus side-by-side. Be sure to evaluate the energy consumption and costs of any units you’re considering. In short, look up. Is your laundry room taking advantage of all the vertical space it can? Look for opportunities to capitalize on space by going vertical: Install shelving units above the washer/dryer, or up the entirety of one wall. Or consider installing a laundry center with a fold-down ironing board and iron storage to take up less floor space that can double as a mini folding station if you’re short on space. Another option is to hang an ironing board over the laundry room door. Could your laundry room benefit from the addition of a sink with sprayer faucet head for pet baths and hosing off muddy shoes? Or perhaps upgrade an existing, dated sink, swapping the white plastic tub for a farmhouse porcelain style with bronze fixtures, a stainless or granite model, or an industrial-look sink. Cabinetry and countertops are another key design and function opportunity if you choose to upgrade. For a quick, budget-friendly yet impactful update from a design standpoint, paint your cabinet surfaces and go for new hardware in crystal-look glass, polished metal or bronze finishes. Another fast update that’s light on the wallet is to remove cabinet doors and let open shelves create opportunities to showcase clever and colorful storage within, such as matching, labeled baskets in either rattan, printed fabric or a solid color family. Open storage also allows quicker access to your most-used items and the opportunity to see at-a-glance what you’re running low on when you’re headed to the store for supplies. If your budget allows for new cabinetry, find your favorite look that also offers intelligent storage solutions such as ironing boards that roll out of drawers and drying racks that pull down from cabinets. Add ambiance with up or down-lit glass doors and stash extra dishware or pottery collections to turn your laundry room into part collectible showcase. Another laundry room attribute that makes laundry life easier is, of course, a folding station. If you don’t have one, look for spatial opportunities to house a big enough solid surface to get clothing, sheets, towels, and your biggest items folded and ready for distribution—spanning the top of the washer (if it’s a front loader) and dryer, folding down from a wall, or on a ready-made or constructed island, for example. Also up for consideration in laundry room updates are pets. If yours doubles as a place for your furry friends to kennel, nap or eat meals, consider upgraded functionality like built-in dog or cat beds, cleverly concealed cat box cubbies and extra cabinet space for pet food and grooming supplies. Why not entertain yourself? Install a flat-screen TV or add portable speakers and pipe in music via a home media player, or create a device station so you can view media, video chat with family or friends, or listen to your favorite tunes or audio books while you get the job done. While you’re at it, if our laundry room is in a much-accessed area of your home, consider creating a charging station for electronic devices as well (far from water sources, of course). Bring some “wow” to the walls, windows and doors. Walls, windows and doors are not only necessities—but opportunities. Use them. Bold, blue-and-white or floral printed wallpaper says “fresh” and can bring instant cheer to your laundry area. Or install a glass or subway tile backsplash behind your washer/dryer or sink and watch it catch and reflect light around the room and introduce a new color scheme that can be echoed in window curtains, painted walls and doors. If your laundry room is one highly trafficked by family, consider painting one or more walls with chalkboard paint and let kids decorate the space with artwork, institute a family message center, or even use it as an extra space to brainstorm your next big coup at work while waiting for the air fluff cycle to finish. Could your laundry room door use an upgrade? Splurge on a paneled, wooden door in a rich wood, or install a Dutch door, painted or stained in your favorite hue to keep pets in or little ones out with the bottom door closed while you let extra light in or listen for the dryer chime by keeping the top door open. 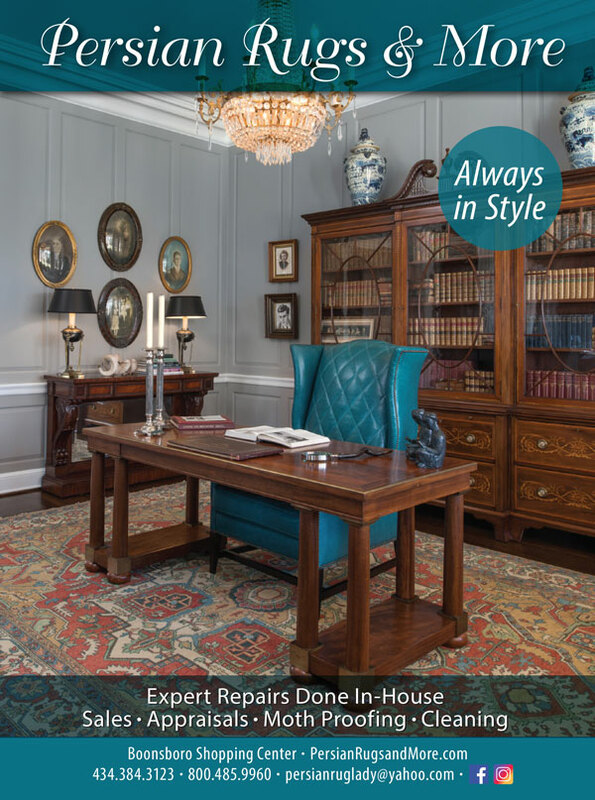 Bonus: a window in the top half lets light in through this novel yet classic door style. 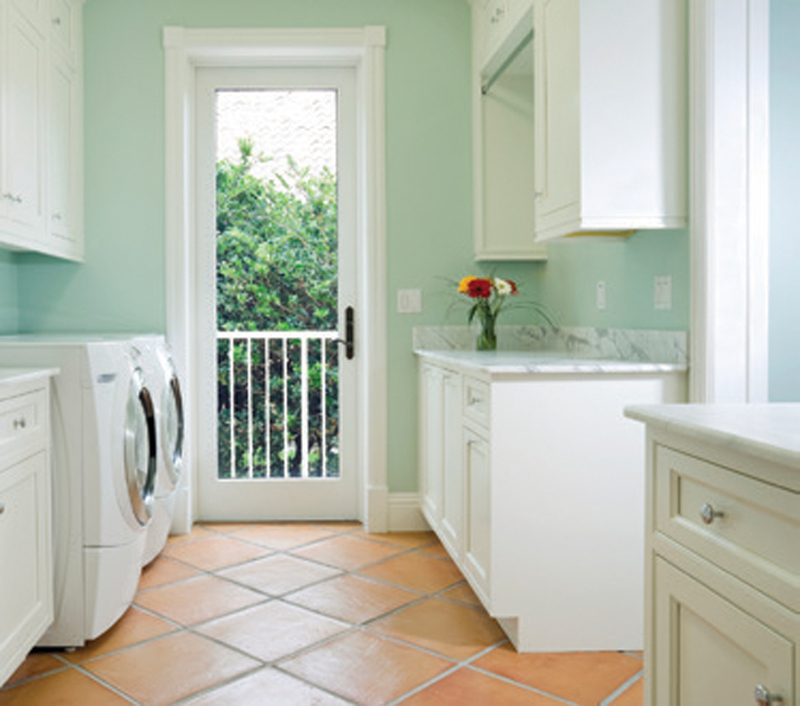 If you’re lucky enough to have a window in your laundry room, use it to bring living room-like charm into the space. Layer bamboo shades and curtains, or install a printed roller or charming plantation shades for an instant, upstyled look. Nothing brings new life to any room faster than a new light source. Up the design and functional wattage on your laundry area with a statement chandelier dripping with crystals, a shiny, oversized industrial pendant, sleek recessed lighting, rustic barn-inspired fixtures or demure and traditional shaded sconces. Also consider areas in which you might incorporate table lamps in your favorite design to mimic a cozy living room and disperse soft, glowing light. Examine your light sources and consider changing light bulbs to LED versions; a single LED bulb can last up to 25 years and provides a whiter, brighter light source. Turn an eye toward trendy storage (and accessories). Storage: it’s the backbone of any successful laundry operation, and whether it’s a single shelf or a room full of cabinetry, where you stash your supplies can be a chance to change up your look. Bring in texture and warm wood with rattan or bamboo laundry baskets and/or coordinated shelf bins. Add function and gleam with industrial-look metal rolling baskets or entire shelving units. Punch things up with pattern and save some space at the same time with collapsible baskets in chevron or floral print for sorting laundry or stashing detergent and fabric softener. Up the luxe factor on your countertops with colored or patterned glass containers for laundry soap tabs, clothes pins, dryer sheets and lint rollers. Use wood, glass or high-shine metal candle holders with flameless candles with programmable timers to make a statement and provide a little romance in the laundry room (why not?) and pull double-duty as night lights for pets or lonely laundry at night. Lastly, look for decorative hooks and stagger them on the wall, where they’ll not only help delicate clothing to air-dry but can also keep hats, umbrellas or coats within easy reach in a laundry room near the garage or front door. If your plan calls for new flooring, consider contributing to a new look with patterned or wood-look laminate flooring, marble-look ceramic tiles or glossy white subway tiles, or opt for natural materials such as real wood or even brick. No budget for new floors? Find your design groove with chunky, easy-care cotton tie rugs or washable looped rugs in a rich or ethnic pattern for an instant update underfoot. No longer do you need your laundry chores be a mind-numbing affair, nor the space in which you launder to be the design eyesore of your home. 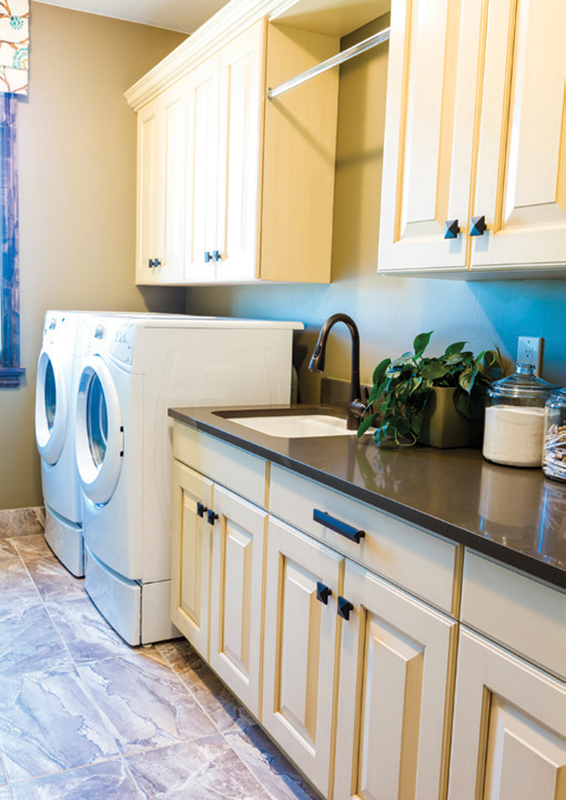 With a little planning, creativity and space-use consideration, a happy life in the laundry room is within your reach.